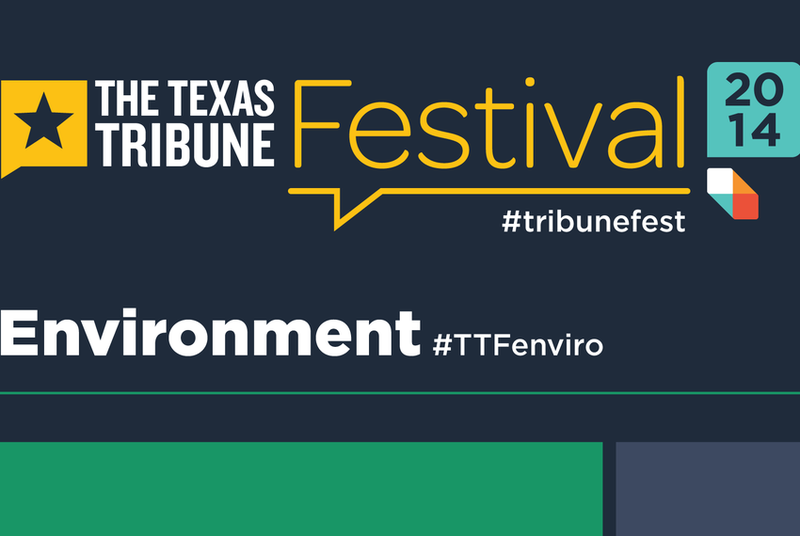 We're liveblogging the sessions from the 2014 Texas Tribune Festival's Environment track. The sessions include panels on the state's water needs, the Texas coast, agriculture in the state and Texas' battles with the federal Environmental Protection Agency. Featured speakers include state Sen. Larry Taylor; state Reps. Myra Crownover, Joe Deshotel and Tracy King; Texas Commission on Environmental Quality Chairman Bryan Shaw; Texas Water Development Board Chairman Carlos Rubinstein; former state Sen. Kip Averitt; Former Texas Land Commissioner Garry Mauro; and Sid Miller, the Republican nominee for agriculture commissioner. Look below for highlights of the weekend's sessions, which are being held on the University of Texas at Austin campus. Editor's note: In two blog posts on the "Texas Vs. EPA" panel, statements by Jennifer Vanos were originally attributed to Laura Miller. Now starting: What's Next for Water? The topic is now what comes next after Proposition 6, a 2013 ballot initiative that takes $2 billion from the Rainy Day Fund to support water supply projects. Kip Averitt, a former state senator, says the process has gone well so far but that the state might have trouble launching conservation projects. Tom Vaughan, an associate professor of biology at Texas A&M International University, shifts the conversation to water quality and the Rio Grande. "When you have two different countries dealing with the same body of water you have special issues that must be dealt with," Vaughan said. Panelists address Mexico and the U.S. The two countries signed a treaty to share water decades ago, but the drought has caused Mexico to fall behind, straining the relationship between the two countries. Rubinstein says 4,840 jobs at risk every year that Texas does not get its promised water from Mexico. Satija asks panelists what else needs to happen now that Proposition 6 and HB 4 have passed. Sansom says the state has to come to grips with the fact that it treats ground water and surface water differently. Archuleta says innovation and technology need to be the focus of the next legislative session. Regarding water quality, "The biggest water quality issue we face statewide today is not from water chemical plants, it's from water that runs off the landscape," Sansom said. Panelists now asked about climate change, which is very controversial within the state. Rubinstein says the state is already doing a lot of things on climate change. He says regional planning groups learn from previous droughts and incorporate those lessons in the future. "We do know that 50 years from now is we're going to have 46 million Texans and 10 percent less water," Rubinstein said. He says the state needs to plan for something that is worse than the drought of record. "What if this drought that we're in right now is the new drought of record? It will change the model," Rubinstein said. Archuleta drought is not a short term fix. He says he advises everyone to diversify to the extent people can and to consider agreements with adjoining utilities. Sansom adds that people should not be fooled by the recent rains, saying that floods in the past that filled lakes but not ended droughts. Regarding the political rhetoric on climate change, Averitt says the issue is polarizing. He acknowledges that weather patterns change and that Texans need to ask themselves how prepared they can be. "Ultimately, we are going to use less water than we do today," Averitt said. An audience member asks how population growth will affect demand for water in the future. Archuleta says in any city water means economic development. He says it boils down to more responsible use of the water. "It's not how we can stop the population growth but how we're going to be prepared for it," Averitt says. Rubinstein says the state water plan addresses that issue. We're about to start the "Saving the Texas Gulf Coast" panel here in Welch Hall! Looking forward to the discussion. Panelists start out by pointing out that although the Gulf Coast is seen as separate from the rest of the state, protecting it is vital to statewide and even national interests. Echoing the words of the likely next land commissioner George P. Bush, former land commissioner Garry Mauro says, "I never thought there was a dichotomy between protecting the environment and business." Mauro says protecting the Gulf Coast is necessary for business and for the environment. You can't make the choice between one or the other. There's over $1 trillion of infrastructure on the coast -- "we're not going to retreat." Taylor echoes Mauro, saying people live on the Gulf Coast because "that's where the water is, that's where the petrochemicals are." Again, arguing Texans can't retreat from the Gulf Coast. Deputy commissioner at the General Land Office Helen Young gives us some scary numbers. More than half of the Texas Gulf Coast is eroding at an average rate of 4 feet per year. But in some places erosion is as high as 30 feet per year. Yikes! Another important point on the importance of the Gulf Coast's safety by Helen Young. After Ike, gas prices went up in Atlanta. That was a big deal after Katrina in New Orleans as well. David Brown pressing panelists on getting people interested in the importance of the Gulf Coast. Storms, oil spills, etc. only happen every few years. How do you keep people's attention? Huffman says the BP oil spill money can help. It's "the presence of something that's actually positive." That's starting to get spent right now but the process has been very slow in Texas so far. What does the legislature need to do, Brown asks? First we need to develop a comprehensive plan for the coast, Taylor says, and we may still be years away from that. "We need to come up with a plan that we can take to the feds ... they did spend $16 billion protecting New Orleans." Taylor says he doesn't want to "wait until another storm hits." But it usually takes a crisis to get people to act, he notes. Take the water legislation, which came in the middle of a severe drought. "That's just the way it works." One of the reasons it's taken so long for scientists and policymakers to come up with a comprehensive protection plan for the Texas Gulf Coast is that they'll likely to have to make tough choices about who gets the most protection. Rep. Joe Deshotel points out that you can't just "build a wall" around industry. Industry's "happy to protect itself," he says, but Texas needs to protect everyone. Garry Mauro says he's disappointed that Davis and Abbott didn't mention coastal conservation during the gubernatorial debate last night. You can work to institutionalize coastal management plans across different government agencies and other organizations, but "you can institutionalize good leadership," Mauro says. The land commissioner is the natural leader to amplify these issues and call people to action, he says. Yes, the governor has to be involved, but someone has to "keep it on the front-burner." Question from Texas Campaign for the Environment on pollution in the Gulf, especially from plastics. Mayor Wax says the city is looking at passing a single-use plastic bag ban, joining cities like Austin and Laredo. Deshotel -- We need to get all Texans interested in Gulf Coast issues whether they live on the coast or not. "The coast is Texas. It's not a part of Texas." Huffman -- We need to restore basic filtering systems of oysters, sea-grasses and saltwater marshes. We need to make sure there's enough freshwater inflows to the Gulf. Mauro -- Leadership is also important. People elected to statewide office should have to make a pledge to protect the Gulf Coast. Taylor -- Adds that coastal erosion is a huge issue that needs to be addressed. Wax -- Freshwater for bays and estuaries is important. And, "don't put political boundaries on national phenomena." We need to protect entire Gulf Coast, not just based on political boundaries. Young -- There's no dedicated funding source for all of this. That makes things uncertain every two years. Finding funding is a key issue. And, we need someone in charge of developing a plan for the Texas Gulf Coast. Good question about how to address problems with Texas fisheries. Taylor says Texas is working with the federal government on illegal fishing, which contributes to the problem. Question on the impact of climate change worsening all these existing problems on the Gulf Coast. Laura Huffman says models and plans, and projects, need to take into account the effect of sea-level rise. Deshotel says: "The fact is we have to deal with the problem of rising water, and we have to deal with it" no matter what. "Once you drown, you drown. It doesn't really matter what caused it." Deshotel stresses the need to deal with the problem and its impacts rather than fight about what's causing it. Mauro says he used to be skeptical of climate change as an issue, until it was 100 degrees on his birthday in February in 1996. And sea-level rise will impact a huge portion of the population on the Texas Gulf Coast, he says. It needs to be dealt with. Mayor Wax says that from a local perspective, "I really don't care what caused it ... I can try and save my coast" from issues like erosion, sea-level rise, lack of freshwater in bays and estuaries, etc. And it's a wrap. Great discussion on an issue that doesn't get discussed enough. Sid Miller - GOP candidate for ag commissioner talks about how agriculture is "way ahead of the game in conservation efforts. Less than 20% of crops are flood irrigated anymore." Blair Fitzsimons - CEO of Texas Agricultural Land Trust - "have to consider private lands as solution to water plans. How that water is managed. Need incentives for private landowners to continue to provide that water source." State Rep. Tracy King: when we get to the point that agriculture is everyone's concern, the better off we'll be. Yes, ag is the biggest consumer of water, but it's not just the farmer's benefiting. Those who are benefiting are the people eating food in Texas and around the country. Miller: On a broader scale, agriculture is a matter of national security. If America becomes dependent on a foreign entity for food, we lose our freedom. It's vital to all Americans - rural, urban, suburban. "We are the world's bread basket." Tiffany Dowell, Assistant Professor at the Texas A&M University AgriLife Extension: Key to agriculture success is making public aware of all farmers and ranchers. "I grew up on a farm. We are good stewards; we are taking care of the land." Jim Sartwelle, Director of Public Policy at the Texas Farm Bureau, drives home importance of conservation: "If we don't get it right now. There's no way we're going to get it right later. If we don't get our ahead of the battle, we've lost before it starts." Fitzsimmons: It's not just about shrinking irrigation. We need to focus on "'How do we incentivize conservation?'" Miller: We are planning for the growth. We are planning for the future. We have the $2B from Rainy Day Fund. King: I'm not convinced we can plan 50 years out, but I think we need to do that. #waterplan "We lose weight after we've had a heart attack." Most people in state haven't experienced that, they don't know what it's like to value every drop. Sartwelle: We've been doing water planning since the 90s. But we've finally gotten it all together. Make sure legislative intent is closely followed. Miller: Current water plan is built from water up. "I think $8B is enough money to complete water plan, if it's used as a force-multiplier. I will insure that the money is not allocated on political basis, but on an as-needed basis." Dowell: Every state in the country - including Texas - has right-to-farm statutes. Having protections written in the law protects agriculture from urban encroachment. Sartwelle: We can make the case to people in Dallas and Houston that support for agriculture is not support for agriculture in it of itself. It's a matter of preserving the "innate Texanness of this state." Our difficulty in representing ag in urban areas, it's not urban vs. rural - it's that people in the cities are used to having access to food and water. "The tap is always turns on. Food is always on the shelves." Fitzsimons: Mineral rights are separated from surface rights and Texas is one of the few states that does not have a surface protection act, which gives landowners some level of protection that their land is not going to be destroyed. Sartwelle: As long as we continue to manage groundwater, it is going to behoove you as an absentee landowner to be interested because it impacts the value of your land long term. King: I'm sure there's not a lot we can do, until that water becomes so expensive that they think twice about it. Miller: We can still have those greenbelts in those parks, in moderation. We have to change the way we're thinking about water in Texas - xeriscape, use native plants. And with that, the 'State of Agriculture' panel discussion is a wrap. Great conversation that hit on an array of topics. Satija starts off with a general question, what does the title of this panel, "Texas vs the EPA" mean to you? Crownover starts off by saying, it shouldn't be Texas vs the EPA or the EPA vs Texas. The EPA is supposed to be working for us, they are not elected officials and we should have the same goals. "Everyone wants a cleaner, better world for our children and our grandchildren." A lot of the conversations though are "dickering about the price." Metzger says "Texas politicians vs the EPA" would be a more apt title for the panel. He says Texans want these regulations, but we have litigation pushed by the state's Attorney General, and higher state offices. Miller says even though Texas is the largest CO2 admitter, by far, but it's about working together. Although she's never had a long and detailed conversation about climate change or global warming with co-panelist Crownover, she says they've travelled to China together to look at carbon-capturing technology. "I think there is so much opportunity in Texas for people to get to that goal, even if they're getting ot that goal by entirely different philosophical means." Shaw says it is time that we say the EPA needs to do the heavy lifting, and the hard science to see why people continue to have respiratory problems, because what we've been doing isn't helping. He says we're missing an opportunity to really make a difference if we don't follow science to where it really leads. Vanos says there are only a few air quality monitors in each city, and it's difficult to scientifically measure who's being exposed, what are they being exposed to and what we can do about it. When it comes down to it, she says we all have the same goal in mind — maintaining well-being, it's just how do we go about it properly to get accurate science. Shaw says they're planning ot hold a conference on the best way to set ozone standards base on the impacts to human health. Vanos says ozone is an interesting pollutant, because it's secondary — it's formed by interactions of other emissions. Studies have attempted to look at the interactive effects of these emissions, and it's difficult to measure what actually causes someone to become ill. "It's a really hard one to maintain standards for," she says. There should be different standards for a child, a healthy adult, and the elderly, says Vanos, and the standards need to reflect all of these populations' ability to exercise outdoors. Because of the EPA's standards, cities like Los Angeles are in much better condition and have much less pollution, says Miller. She says someone has to be there to move the benchmark forward so that we keep improving. "We need to make sure we're chasing the right rabbit," Shaw responds. We're making progress in reducing the pollution concentrations, but we're not improving health impacts for people with respiratory challenges, he says. "We know people are getting sick, and they're not getting better as we clean up the air," says Shaw. Crownover brings up the statewide smoking ban she's worked on. "We're chasing the bar that gets higher and higher, so the average citizen thinks our air is actually dirtier now than it was," says Crownover, even though we know our outdoor air quality has greatly improved. She says an asthma association told her that it's probably indoor air that's causing respiratory problems to continue to increase. Metzger says science shows a clear link between harmful exposure to these chemicals and human health. Shaw says he's not suggesting we shouldn't study and find the correct standards, but it doesn't help to keep basing standards on bad science. Metzger asks, then why did you oppose the cross state air pollution rule which would save lives? Shaw says the reason we opposed that is the EPA was including Texas in the rule without giving the state the ability to comment on it. The EPA ended up using a model to suggest that Texas' emissions would impact an area 1,000-plus miles away, based on data taken from a monitor next to a steel mill. They wanted Texas to have a 40 percent reduction, and it wasn't based on good science, he says. Vanos says you can't ignore cross-state pollution, just like we can't ignore emissions from China, but at the same time, setting those standards is extremely difficult and the EPA has done a tremendous amount of work to do it. In any studies she's done, Vanos says ozone pops up as one of the most harmful, and one of the most interactive with other emissions. Miller says the conversation has been focused on what standards have been set and whether they're good or bad, but there's a flip side. After years of fighting dirty coal plants and emissions, she's now building a coal-gassification plant that captures 98 percent of its carbon. She says there should be more of a focus on building better 'mouse-traps,' because it's inevitable we're going to have to do something about reducing CO2 emissions. It's the companies that address carbon emissions now that will come out as winners, she says, and that TCEQ should look to the industry winners for setting better standards. Shaw says when you have ever-moving targets created by the EPA, it's difficult to companies to develop new technologies to meet those standards. It has been such a top-down mandate that it's missed an opportunity, he says. If they'd set those standards and allowed industry flexibility to be creative, Texas would have been able to drive the direction of greenhouse gas emissions and improve the emissions. If we don't burn the coal here, it's going to be burned in China, and so it's about finding ways to incentivize energy efficiency here. Metzger says there is a way to work with the EPA, and that's to actually work with them, rather than file lawsuits. For example, every other state filed permits for the greenhouse gas permitting rule, except for Texas, and so the EPA had to step in and do it for them. If we actually worked with the EPA, there is enormous flexibility for states, he says, such as producing clean solar and wind energy that we can sell to other states. Crownover says Texans want common-sense answers, and they want to stay away from ideology. She's concerned about an overreach by the EPA, and says we need to have a partnership from the Energy and Resources Committee. She says there's must be a balance between energy, environment and economy. We're blessed to be able to turn on the lights and pump gas whenever we want, but that means we have to deal with the other impacts to our environment and economy. "We want to keep the balance, we want to keep the conversation open and respectful without ideology blocking the way," she says. Shaw says my job is not to rubber-stamp whatever the EPA wants to do, and the TCEQ has a responsibility and a right to question when the EPA moves forward wtih approaches we don't agree with, and we don't think are legal. The EPA has not been focused on the rule of law, and their authority, but instead, what do we want, he says. If the EPA presents a rule that blatantly ignores statute, Shaw says, even if it would be in his best interest, it's his job to point it out and challenge it. Shaw says it's not about keeping score on lawsuits, and he has tried to work with the EPA, but often their staff would not take meetings to discuss these rules. At the regional level, he says that the communication with EPA staff has improved. Metzger says we've had to sue Chevron, Exxon and other groups themselves, and gotten money that could go to health causes, than the TCEQ. These are all self-reported violations on your website, he says, and if you put your mind to it — all the resoucres of the TCEQ — we could have much better compliance with the law. Shaw responds, our responsibility is not to extract as much money as we can, but to put in place the right regulations. Miller says it's Texas that has two of the most cutting edge technologies developing for carbon-capture, including a project at a large existing coal plant, and at the new plant she's working on in Odessa. Texas is better poised in the entire country to succeed in meeting the goals because of everything the legislature, the governor, the TCEQ and the industry are doing, she says. We've got wind, solar and energy efficiency projects — "I think Texas is going to be fine," she says. Question from the audience on contested case hearings going through the SOAH process. Crownover says the legislature is looking at the issue. Metzger says the current process is a good way for citizens to present evidence, which is why people from the industry don't like it. Miller says they used contested case hearings in the past. If you get rid of that process for citizens to come in and make a case for better technology than what's being proposed, she says she can't even imagine how unfair the system would become. To answer an audience question, Miller explains how the gassification process works. Instead of lighting the coal on fire and capturing the emissions, they grind the coal up, put it in a machine, raise the temperature so that it turns into a gas and capture all the separated elements — like sulfur that causes acid rain.